On Friday night at my sister’s place, we were were swapping war stories of head pains. 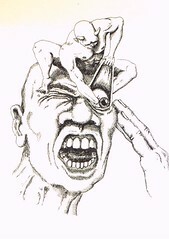 She had a read of the Wikipedia article on cluster headaches and, noting the description, the illustration by J.D.Fletcher, and nickname “suicide headache”, she had to admit they piss all over her puny migraines. While I’ve had some pretty bad ones in the past (particularly before they were properly diagnosed and the medication prescribed), they’re nowhere near as bad as they once were, and nowhere near as bad as some others have them. I’m just glad I know the medication (Veracaps) that helps me. And I have nothing but sympathy for those who manage with them, without help. PS. Forgot the worst bit about re-reading the article on cluster headaches: Ingestion of alcohol or chocolate is recognized as a common trigger of cluster headaches when a person is in cycle or susceptible. I don’t really care about alcohol, but chocolate — oh no! Ouch! You have my sympathy, absolutely. You mention that the headaches are back for autumn. Does this mean that they are seasonal? e.g. a link to cooler weather or maybe leaves falling off trees??? I’m sure you’ve checked every possible link. Among the most widely accepted theories is that cluster headaches are due to an abnormality in the hypothalamus; Dr Goadsby, an Australian specialist in the disease has developed this theory. This can explain why cluster headaches frequently strike around the same time each day, and during a particular season, since one of the functions the hypothalamus performs is regulation of the biological clock. Metabolic abnormalities have also been reported in patients. I tend to get them for a short period during autumn and spring. Definitely a huge ouch. You have my sympathy indeed. Thank goodness the medication helps a bit. Ouchy Ouch. That is so annoying, My friends have headaches in the late fall and winter and early spring. Thats gotta hurt. Are you sure the caffeine is doing you any good? Mikeys, it’s obviously an inexact science, but I think so (and it’s certainly cited as helping by others). My sympathies Daniel. And I do love the comments of “ouch”. Not the term I use. I have not had an attack for about 3 years so am expecting this spring to be a complete [email protected] Yes they are seasonal – but often not annual. Go figure. Chocolate for me does not trigger at all – so given your love of the stuff, I hope for your sake you are also so inclined. I didn’t know that Goadsby was Australian. Good to know! I have yet to have a female concur that CH is worse than child birth. At the very least you get something good out of childbirth! But I do agree with theterm suicide headaches – been on the verge a few times. Mine last 12 or so weeks, up to 10 per day, generally no more than 45 minutes. May the season change quickly for you! And yes – huge amounts of caffeine – like 3 redbulls or 4-5 cups of strong real coffee – often do have an effect for me too. As does pure oxygen – medical grade – at the onset of one. And seratonin (sp?) taken at the first sign of the start of an episode has on one occasion seemingly shortened the season for me last time. I find the “webbing between the thumb and your index finger” works best. Simply use a thumb to push between your index finger & thumb on your other hand and push in. You’ll need to keep doing it until you find the “sweet spot” which actually hurts. Hold it in for a minute or two, then swap to the other hand and keep on going. You’ll actually feel it “go in” as in you’re releasing pressure & your head will become much clearer. You can also do the same when pushing pressures points underneath your neck, at the top of your back. Same thing, you’ve got to push in areas where it hurts. No pain, no gain is the way it works but you’ll feel a million times better compared to Aspirin. I’ll look into it Josh, but note this is not a type of pain that is treatable by conventional pain killers. Aspirin, for instance, doesn’t make one jot of difference. Caused by Chemtrails, they have been chembombing for days now, as they want to keep up the lie pretence that Global Warming actually is a real phenomena. They spray the atmosphere (Geoengineering Programmes) with direct and indirect aerosol particles containing Barium, Melanin and Aluminumn etc.. you will feel sick and drowsy, a condition called ‘ BRAIN FOG’ and get itchy rashes on exposed skin eg: arms, your sinuses will play up, you will get mega headaches. Time to move to Cook Islands.